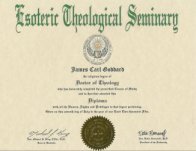 For years now the seminary has offered religious PhD degrees in Metaphysics, Religion, Religious Studies, Ministry, Pastoral Counseling, Spiritual Counseling, etc. Degree candidates can customize their PhD according to the work they are doing in the field of spirituality. Some are working in a spiritual healing center, or maintaining a spiritual counseling practice as a part of their ministry. (All of our PhD’s and Doctor of Divinity, Doctor of Theology graduates must become ordained as clergy by us — which is free with their degree — if they are not already ordained elsewhere). Not only can you choose your PhD discipline and thus your PhD title, you can also add a concentration on your degree diploma. For example, last month we conferred a PhD in Metaphysics with a Concentration in Holistic Counseling. Another concentration was PhD in Pastoral Counseling with a concentration in Ministry. There are all manner of ways to describe what you do. You must of course write your thesis / dissertation on that topic, but if it’s the area you are focusing your current spiritual work, writing the thesis about it will go easy. This entry was posted in Religious Doctorate Degrees, Spiritual Healing or Counseling Center and tagged PhD diploma, PhD Metaphysics on April 22, 2014 by admin. I have been ordained as Rabbi by EITH since 6.3.2010. While I am a licensed a physician assistant (psychiatry) x 30 years and earned my PhD in counseling psychology, do I need additional credentialing to perform pastoral counseling in the State of Missouri? I have quite a few patients and individuals who have spiritual issues which impede their progress to a happier and healthier life. Thank you for addressing my questions. If you are already an ordained Rabbi and are also licensed and holding a PhD in Counseling Psychology you do not need extra credentials in order to offer spiritual guidance / counseling to others. Ironically, the clergy ordination offers you the legal right to give spiritual counseling and accept donations for it. The PhD and counseling license are still a wonderful asset of course because such credentials reassure the people to whom you are providing the spiritual counseling and healing. It’s the clergy – parishioner relationship sanctity that actually affords the ability to offer counseling. To become ordained immediately, visit our ordination page, to receive a PhD in Spiritual Healing or Pastoral Counseling visit our PhD Page.